The mRNA binds to the small ribosomal unit (the bottom piece of the ribosome). 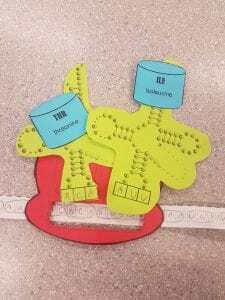 The small and large ribosomal units then attach. The mRNA is actually the key to starting the entire process as the P-site must read the start codon AUG which permanently stays on the mRNA. In the image below, you are able to see the mRNA is being read by the P-site on the ribosome. This is the process of initiation and how it works. The A-site reads the next codon in the mRNA and then it brings in matching complimentary tRNA, tRNA has 3 letter codes called anticodons that are complementary to the codons on the mRNA. The new tRNA binds to the P-site, and another one binds to the A-site. The amino acid in the A-site then let’s go of the tRNA in the A-site and binds to the neighboring amino acid in the P-site. This is the process for elongation. The image below shows how the amino acids lets go of the tRNA in the A- site and binds to the neighboring amino acid in the P- site. The mRNA is read by the ribosome also has what is called a stop codon. This codon is a signal for the ribosome to stop reading the mRNA and for the tRNA to stop binding there are no matches in the tRNA to go with the stop codon. After the stop codon has been read, no new amino acids are added to the chain. This leads the ribosome to split into the two units again. The fresh polypeptide is then released and ready for use. This is how the last process works. 2. The materials used in this lab showed really well how translation works and what the mRNA actually does. There were a few problems though the first on had to be that you are not able to see how the ribosome actually splits. And the other issue was that we only had one ribosomal unit and the actual process uses two. These were the only inaccurate things in this lab. It was a lot of fun building the chains of amino acids and exploring how everything in DNA and mRNA works. I will have to say technology is a blessing because it helps us with everyday problems and a great tool for school research and projects. Technology is very helpful for detectives and to track down phones of missing people, and social media that is downloaded on our technology spreads information that is important such as a school shooting, or a kidnapping, or a dangerous person who walks around town, this information is extremely important and if it weren’t for people on social media spreading this news like wildfire then a lot of people would not know and then more kids will be kidnapped or more shootings will occur. Another thing that technological devices help with movements like #BlackLivesMatter so black people can be employed and that they can vote. And that technology really helped with this important event. And that technology is a huge part of modern medicine especially all the machines such as MRI’S, CAT scans, and x rays. Also, with technology, they were able to invent machines that can test your blood and find hidden diseases. Also, there is this machine that only takes one drop of blood for the test instead of taking a whole test tube, and people are not as afraid to get them done since there are no needles. Our society advanced and it is important because we have a new way of communication, entertainment, and safety. If I ever need to contact an emergency service instead of running to a landline, I can pull out my mobile device and call for help, that is a big part of safety knowing that nothing can happen to you. And having that advantage to access the internet to research certain projects and all the information that pops up and that you can use, instead of going to the library and searching for information by hand. And helpful proofreaders such as Grammarly help with essays, job applications, and many more uses. I don’t understand how people can blame technology for problems that they are experiencing with social communication even though it’s the person’s choice to stay on their device all the time. It should be used moderately and not overused. Explain the structure of DNA – use the terms nucleotides, antiparallel, strands, and complementary base pairing. DNA is made up of sugars, phosphates, and nitrogen. The sugars and phosphates create the two backbones made of sugar-phosphates and nucleotides. The bases of the nucleotides are inside the ladder shape. The two strands of DNA are antiparallel as they are read in opposite directions. Certain bases attract each other and create what is called complementary base pairing. There are four bases Adenine, Thymine, Guanine, and Cytosine. The two pieces of DNA are kept together by hydrogen bonds in the middle of the nucleic acid. DNA is replicated by being split into two by a helicase and then the two strands are paired with different strands through complementary base pairing. This process is called DNA polymerase. The result is two identical DNA strands. This is the only process for how DNA is able to replicate. 2. 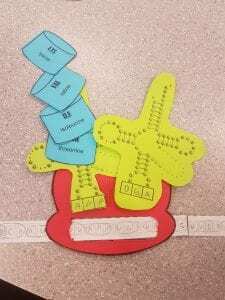 This activity really explained DNA replication and how it can twist into a double helix, also it was a lot easier to build in in 3D then to see it on an image. To improve the project I think that we should use mini marshmallows to represent the complementary base pairing and twizzlers or some long piece of candy to form the two backbones. But the watermelon gummy and the two bigfoot gummies did a great job representing DNA polymerase and the unzipping of DNA.